Ruben Loftus-Cheek has been given the opportunity to showcase his talent on the global stage at the World Cup in Russia, and Liverpool should be taking note. The Chelsea midfielder, who spent last season on loan at Crystal Palace, is part of Gareth Southgate’s England squad. Following Dele Alli’s injury against Tunisia, Loftus-Cheek was handed a starting spot in the Three Lions’ Group G clash on Sunday. It was an historic day for England as they earned a 6-1 victory over Panama – the nation’s highest ever score at a World Cup. 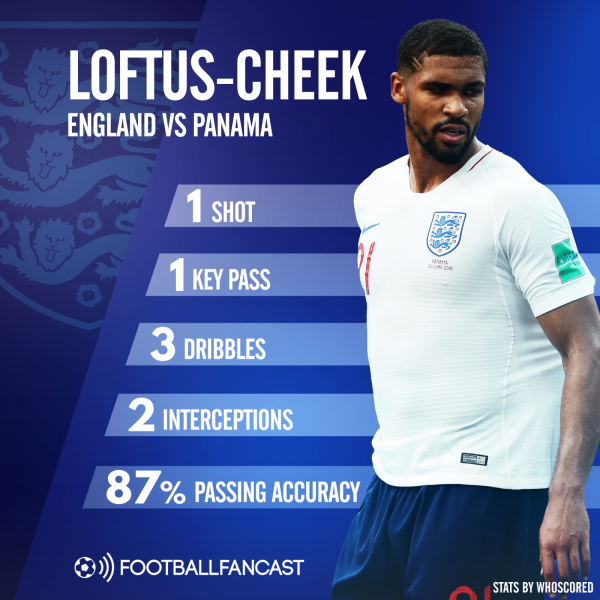 Loftus-Cheek may not have grabbed the headlines, but he completed attacking and defensive tasks comfortably considering the magnitude of the fixture. As well as having his own shot at goal, the midfielder intercepted Panama attacks on two occasions. Liverpool have been linked to numerous midfielders during the transfer window, and Loftus-Cheek should be added to the list. The Chelsea star possesses the rare combination of delicate skill and power, and in terms of positioning, he will be the biggest challenger to Alex Oxlade-Chamberlain. Whether the Reds would be able to successfully pursue Loftus-Cheek remains to be seen, but they should certainly be part of the conversation.